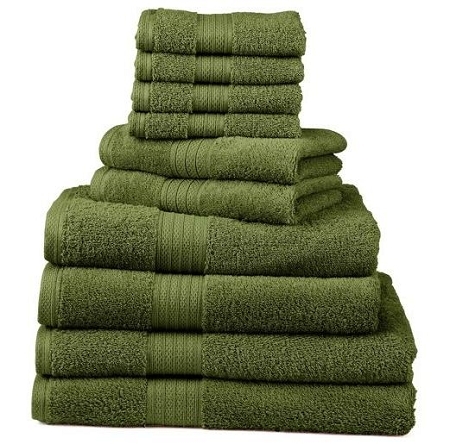 Turn your bathroom into a luxurious retreat with this deluxe 10-piece towel set. Made from durable 100% cotton, this lavish towel set includes enough bath sheets, bath towels, hand towels and wash cloths for a family of four. You'll enjoy unparalleled softness and absorbency, as the fibers are tightly woven to quickly wick moisture from your body. Plus, this 10-piece towel set is not only easy to clean — it becomes softer and fluffier with each machine wash and dry. •Soft, absorbent and luxurious, this deluxe 10-piece towel set is made of durable 100% cotton.This 10-piece towel set is machine washable and can be tumbled dry, Towel set becomes softer and fluffier with each wash and dry, Easy to clean, Towel set fibers are tightly woven to quickly wick moisture from your body, 2 bath sheets: 30'' x 60'', 2 bath towels: 27'' x 54'', 2 hand towels: 16'' x 28'', 4 wash cloths: 12'' x 12'', Price include 1 line of print on each towell. Sets are usually embroider on increment sizes Wash cloth, .50' letter, hand towel, 1 inch letter, and bath towel 2 inch lettering.